Agency theory, Discretionary Accruals, Earnings Management, Managerial ownership. The purpose of this paper is to investigate the relationships between ownership structure and Earnings Management (EM) of Egyptian companies. Discretionary accruals using the modified Jones model is evaluated to calculate the extent of EM. A sample of 50 companies listed on the Egyptian stock market for twelve years is used in the study. Three ownership indicators for concentration are included in the current research: block holder ownership, managerial ownership, and public ownership. A set of control variables are used in the current study: return on assets, firm size, firm age, debt ratio and market to book value. The statistical results indicated that there is a positive relationship between the Block holder ownership and the degree of earning management. However, no relationship was found between the Managerial Ownership and the Public Ownership on level of Earning Management. Agnes Cheng, C. and Reitenga, A. (2009). Characteristics of institutional investors and discretionary accruals. International Journal of Accounting & Information Management, 17 (1), 5-26. Al-Fayoumi, N., Abuzayed, B and Alexander, D. (2010). Ownership Structure and EMin Emerging Markets: The Case of Jordan. International Research Journal of Finance and Economics, ISSN 1450-2887 Issue 38 28-47. Alves, S. (2013). The impact of audit committee existence and external audit on earnings management: evidence from Portugal. Journal of Financial Reporting and Accounting, 11 (2), 143-165. Amar, B. (2014). The Effect of Independence Audit Committee on Earnings Management: The Case in French. International Journal of Academic Research in Accounting, Finance and Management Sciences, 4(1), 96–102. Bedard, J., Chtourou, M. and Courteau, L. (2004). The effect of audit committee expertise independence, and activity on aggressive earnings management. Auditing A Journal of Practice & Theory, 23(2), 13-35. Bhimani, A. (2008). Making corporate governance count: the fusion of ethics and economic rationality. Journal of Management & Governance, 12(2), 135–147. Boulila, N. and Mbarki, I. (2014). Board characteristics, external auditing quality and EM Evidence from the Tunisian banks. Journal of Accounting in Emerging Economies, 4 (1), 79-96. Charitou, A., Lambertides, N. and Trigeorgis, L. (2007). Earnings behavior of financially distressed firms: the role of institutional ownership. Abacus, 43 (3), 271-296. Chen, Y. and Rezaee, Z. (2012). The role of corporate governance in convergence with IFRS: evidence from China. International Journal of Accounting & Information Management, 20 (2) 171-188. Chen, Y., Elder, J. and Hsieh, M. (2007). Corporate governance and earnings management: the implications of corporate governance best-practice principles for Taiwanese listed companies. Journal of Contemporary Accounting & Economics, 3 No. (2), 73-105. Chung, H. and Kallapur, S. (2003). Client importance, non-audit services, and abnormal accruals. The Accounting Review, 78 (4), 931-955. Chung, R., Firth. M., and Kim. J., (2002). Institutional monitoring and opportunistic earnings management. Journal of Corporate Finance 8: 29-48. Cohen, D. and Zarowin, P., (2008). Economic consequences of real and accrual-based EM activities. Leonard Ster School of Business& New York University, Working Paper. Davidson, R., Goodwin-Stewart, J., Kent, P. (2005). Internal governance structures and earnings management. Accounting & Finance, 45(2), 241–267. Dechow, M., Hutton, P., Kim, H. and Sloan, G. (2012). Detecting earnings management: A new approach. Journal of Accounting Research, 50(2), 275–334. DeFond, L., Jiambalvo, J. (1994). Debt covenant violation and manipulation of accruals. Journal of accounting and economics, 17(1), 145–176. Dimitropoulos, E. and Asteriou, D. (2010). The effect of board composition on the informativeness and quality of annual earnings: empirical evidence from Greece. Research in International Business and Finance, 24 (2), 190-205. Elham, S., Salehi, H. and Vali Pour, H. (2016). A study of the interaction of audit quality and ownership structure on EM of listed firms on Tehran Stock Exchange. International Journal of Humanities and Cultural Studies, ISSN 2356-5926 1596-1606. El-Sayed, I. (2012). EM to meet or beat earnings thresholds Evidence from the emerging capital market of Egypt. African Journal of Economic and Management Studies, 3 (2), 240-257. Gabrielsen, G., Gramlich, J. and Plenborg, T. (2002). Managerial ownership, information content of earnings, and discretionary accruals in a non–US setting. Journal of Business Finance & Accounting 29 (7‐8): 967-988. Gerayli, S., Yanesari, M. and Ma’atoofi, R. (2011). Impact of audit quality on earnings management: evidence from Iran. International Research Journal of Finance and Economics, 66, 77-84. Gonzalez, S. and Garcia-Meca, E. (2014). Does corporate governance influence EMin Latin American Markets? Journal of Business Ethics, 121 (3), 419-440. Gul, A., Fung, K. and Jaggi, B. (2009). Earnings quality: some evidence on the role of auditor tenure and auditors’ industry expertise. Journal of Accounting and Economics, 47 (3), 265-287. Gul, A., Chen, J. and Tsui, S. (2003). Discretionary accounting accruals, managers’ incentives, and audit fees. Contemporary Accounting Research, Vol. 20 No. 3, pp. 441-464. Habbash, M. (2010). The Effectiveness of Corporate Governance and External Audit on Constraining EM Practice in the UK, Durham University. Hassan, A., Romilly, P., Giorgioni, G. and Power, D. (2009). The value relevance of disclosure: evidence from the emerging capital market of Egypt. The International Journal of Accounting, 44. (1), 79-102. Hsu, G., and Koh, P. (2005). Does the presence of institutional investors influence accruals management? Evidence from Australia", Corporate Governance 13, 809-823. Jelinek, K. (2007). The effect of leverage increases on earnings management. Journal of Business & Economic Studies, 13 (2), 24-46. Jensen, C. and Meckling, H. (1976). Theory of the firm: managerial behavior, agency costs, and ownership structure. Journal of Financial Economics, 3 (4), 303-360. Johari, H., Saleh, M. Jaffar, R. and Hassan, S. (2008). The influence of board independence, competency and ownership on EM in Malaysia. International Journal of Economics and Management, 2(2), 281-306. Jung, K. and Kwon, Y. (2002). Ownership structure and earnings informativeness: evidence from Korea. The International Journal of Accounting, 37 (3), 301-325. Klein, A. (2002). Audit committee, board of director characteristics, and earnings management. Journal of Accounting and Economics, 33 (3), 375-400. Kouaib, A. and Jarboui, A. (2014). External audit quality and ownership structure: interaction and impact on EM of industrial and commercial Tunisian sectors. Journal of Economics, Finance and Administrative Science, 19, 78–89. Latif, S. and Abdullah, F. (2015). The effectiveness of corporate governance in constraining EM in Pakistan. The Lahore Journal of Economics, 20(1), 135–155. Mitra S. (2002). The Impact of institutional stock ownership on the firm EM practices: An empirical investigation", Louisiana State University and Agricultural and Mechanical College, PhD Thesis. Park, W. and Shin, H. (2004). Board composition and EM in Canada. Journal of Corporate Finance, 10 (3), 431-457. Parveen, S., Malik, N. Mahmood, Y. and Ali, F. (2016). Impact of Ownership Structure on Earnings Management: Evidence from Pakistani Banking Sector. Journal of Poverty, Investment and Development, 23, ISSN 2422-846, 24-34. Peasnell, V., Pope, F. and Young, S. (2005). Board monitoring and earnings management: do outside directors influence abnormal accruals? Journal of Business Finance & Accounting, 32 (7/8), 1311-1346. Peasnell, V., Pope, F. and Young, S. (2000). Detecting EM using cross-sectional abnormal accruals models. Accounting and Business Research, 30 (4), 313-326. Ragab, A. and Omran, M. (2006). Accounting information, value relevance, and investors’ behavior in the Egyptian equity market. Review of Accounting and Finance, 5(3): 279-297. Roodposhti, F. and Chashmi, S. (2011). The impact of corporate governance mechanisms on earnings management. 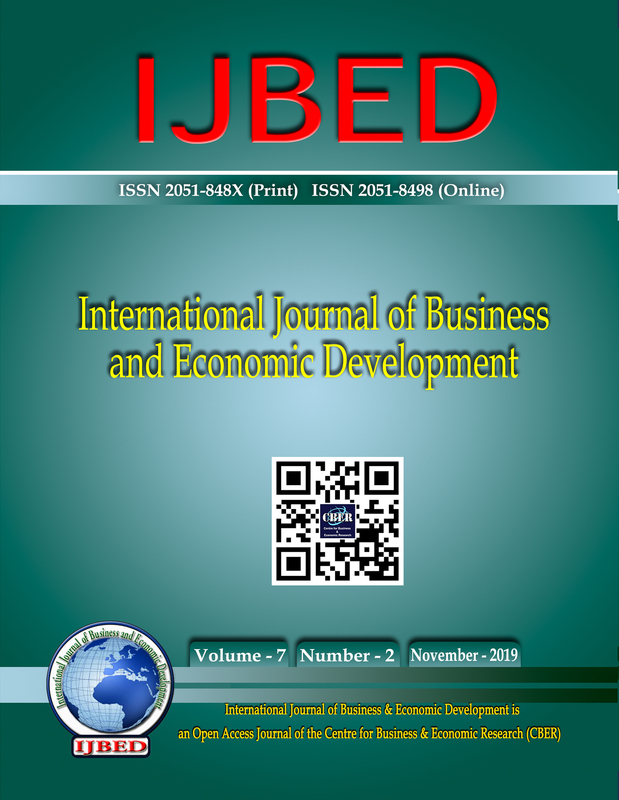 African Journal of Business Management, 5 (11), 4143-4151. Saleem, E. (2016b). Audit quality and earnings management: evidence from Jordan. Journal of Applied Accounting Research, 17 (2) 170-189. Sanchez-Ballesta, P. and Garcia-Meca, E. (2007). Ownership structure, discretionary accruals and the informativeness of earnings. Corporate Governance: An International Review, 15 (4), 677-691. Shah, A., Zafar, N. and Durrani, K. (2009). Board Composition and EM an Empirical Evidence Form Pakistani Listed Companies. Middle Eastern Finance and Economics, 3(3), 30–44. Shleifer, A. and Vishny, W. (1997). A survey of corporate governance. The Journal of Finance 52, 737–783. Siregar, S. and Utama, S. (2008). Type of EM and the effect of ownership structure, firm size, and corporate-governance practices: Evidence from Indonesia", The International Journal of Accounting 43(1), 1-27. Tanewski, G. and Bartholomeusz, S. (2006). The Relationship between Family firms and corporate Governance. Journal of Small Business Management, 44, 245-267. Taufil-Mohd, K., Md-Rus, R. and Musallam, S. (2013). The Effect of Ownership Structure on Firm Performance in Malaysia. International Journal of Finance and Accounting, 2(2) 75-81. Teshima, N. and Shuto, A. (2008). Managerial ownership and earnings management: theory and empirical evidence from Japan. Journal of International Financial Management & Accounting, 19(2), 107-132. Tsipouridou, M. and Spathis, C. (2014). Audit opinion and earnings management: Evidence from Greece, in: Accounting Forum, 38(1), 38–54. Velury, U. and Jenkins, D. (2006). Institutional ownership and the quality of earnings. Journal of Business Research 59(9) 1043-1051. Wang, M. (2014), “Which types of institutional investors constrain abnormal accruals?”, Corporate Governance: An International Review, Vol. 22 No. 1, pp. 43-67. Wei, B., Xie, X. and Zhang, R. (2005). Ownership structure and firm value in China’s privatized firms: 1991–2001. Journal of Financial and Quantitative Analysis, 40(1), 87–108. Yeo, H., Tan, P., Ho, W. and Chen, S. (2002). Corporate ownership structure and the informativeness of earnings. Journal of Business Finance & Accounting, 29 (7/8), 1023-1046. Zgarni, I. (2016). Effective audit committee, audit quality and EM Evidence from Tunisia, Journal of Accounting in Emerging Economies, 6 (2) 138-155. Zhang, H. and Kyaw, K. (2017). Ownership Structure and Firm Performance: An Empirical Analysis of Chinese Companies. Applied Economics and Finance, 4(2), 57-64. Zhong, K. and Gribbin, W. and Zheng, X. (2007). The effect of monitoring by outside block holders on earnings management. Quarterly Journal of Business and Economics, 46 (1), 37-60.